There are Three Unions of Elves and Men. • Tuor and Idril [who produced Earendil]. Each of these unions is critical to the fulfilment and fate of the Race of Men. Tolkien, on more than one occasion, draws attention to the parallel between Arwen and Luthien. They play similar parts in fulfilling the Plan of the Creator in the overall mythology for Middle-earth and Arwen is a type of renewal of the character of Luthien. Further on, it will be discussed how the character of Arwen carries Marian parallels, but discussion is needed on these aspects of Mary to develop them later in Arwen. Mary has always been attributed many titles and names that are indicative and reflective of her role and place. Mary is the 'Jewel of the Father'; she is the 'Perfect Woman', the 'Morning Star'. Another name accorded to her is that of 'Arc of the Covenant'. [Go here to read many other names]. The name 'Ark of the Covenant' is from the fact that Mary bore God in her womb much like the Ark carrying the Presence of God in the Old Testament. And in fact, in the writing of the gospel story of the Annunciation [the Angel coming to Mary], the same language in the original Greek is used for Mary as the Ark of the Covenant, "the presence of the most high overshadowed her", much like the language used in the Old Testament when referring to the Ark. It also brings up the mystery of Mary and the Church being inextricably linked in imagery and life. Mary is the Mother of the Church and its model. She is the first disciple. But the Church also carries the imagery of a Mother to all the faithful who follow Christ. Just as Mary carried Jesus in her womb, so also the Church carries the Presence of Jesus in the Tabernacle, found in every Catholic Church. In many ways the Church represents the virginal womb of Mary and vice versa, where believers can go to find love and be united with Jesus. There is a beautiful parallel in making the sign of the Cross with Holy Water [an especially blessed saline solution] when one enters a Catholic Church that is symbolic of the saline solution found in a mothers womb. When entering a Church one is entering a Mother who cares for her children and one mystically enters the womb of Mary to be united with Jesus. In fact the Second [New] Eve theme is especially strong between the both of them. Mary's role as the Second Eve has already been explained [First and Last Things], but the Church is also the Second Eve. When Adam said to God that he was alone, God put him into a deep sleep, opened his side, took a rib and created Eve. Jesus is the New Adam, and similarly, he falls asleep on the Cross and his side is opened by the soldier's lance, from where flowed Blood and Water-; i.e. Eucharist and Baptism. These two Sacraments are the Birth of the Church, the New Eve. The Church is the Mother of All, just like Mary. The name Arwen means 'Noble Maiden' in Elvish. In comparing Arwen with Luthien [above], Tolkien shows her beauty, but also her role to come. "A great sign appeared in the sky, a woman clothed with the sun, with the moon under her feet and on her head a crown of twelve stars." [Rev 12:1]. In Catholic understanding this is another reference to Mary [and also that of the Church] and her role in the end times. Notice the symbolism with the Sun, Moon and Stars. In many of the apparitions of Mary in the 20th century [and also those of earlier times], Mary has appeared in this manner as described in Revelation. [Go here to read about Marian apparitions of the 20th century]. After the destruction of the Ring and the Restoration of the Kingdom of Men, now both Day and Night is beautiful. Evil has passed away. In the overall mythology, night and dark were to be feared by the free races. Similarly, the Orcs wouldn't travel under the sun; Gollum hated the sunlight and moonlight. As already mentioned, this is because these sources of light for Middle-earth were all created from some element coming from the Two Trees in the Blessed Realm. The sunlight, moonlight and starlight are all images and symbols of the source of good in Middle-earth. Arwen is like a second Luthien, and takes Galadriel's place in Middle-earth, just as Mary is the second Eve, and renews her role as the Mother of All. With the passing of evil, the night now holds no fear, and Arwen's place comes to the fore. Arwen makes a free choice, renounces her right to immortality and sacrifices a life with her people. She cleaves to Aragorn, the King come again, the True King, and in doing so helps restore the Kingdom of Men. She becomes the Queen of the Re-United Kingdom in the White City of Minas Tirith. The Second Eve theme is current here as she plays a vital role in the plan of restoration for the Noble Kingdom of Numenor [Gondor and Arnor] the one Kingdom of Men who gave reverence to Eru [Iluvatar], the One God. He also mentions that it was Arwen who suggested that Frodo go over the Sea to the Undying Lands; "...what is meant is that it was Arwen who first thought of sending Frodo into the West, and put in a plea for him to Gandalf [direct or through Galadriel, or both], and she used her own renunciation of the right to go West as an argument. Her renunciation and suffering were related to and enmeshed with Frodo's [suffering]: both were parts of a plan for the regeneration of the state of Men." She sacrifices and offers. Her sacrifice bears beautiful fruit for Frodo who is allowed to pass over the Sea to the Undying Lands. Her suffering and love purchases a special grace for Frodo, just like Mary who suffered for Humanity [like her Son Jesus], and it bears special fruit for her children. Frodo is an 'everyman' hero that in some way represents all of us. She makes a great sacrifice and in the end Arwen's soul is pierced by a sword of sorrow and bitterness as Aragorn departs Middle-earth. It was bitter for her to receive the fate she had chosen but she remained faithful to her decision. Mary is also an example of faithfulness, purity, love and true beauty. In giving her son Jesus over to the Father's will for the redemption of the world, a sword pierced her soul [Luke 2:35] and she suffered immensely seeing him die. As God has gifted his Son to us, so also has Mary, and in doing so, she also participates in the gift to us of the Eucharist, the True Presence of Jesus in the Bread and Wine. When Jesus died upon the cross [with Mary watching at its foot] his side was pierced by the soldiers lance, and water and blood flowed out. This is a symbol of the great Sacraments of Baptism and the Eucharist which flow from Christ's heart. Mary was there still offering her yes to the Father. There is a particular spiritual mystery in Mary's presence at the altar of the Mass, where she stands at the foot of the Cross [the sacrifice of the Cross is made present on the alter] and continues to offer her Son to the Father and perpetuates her Yes. She is an example of obedience and love and self-sacrifice. She resides with the faithful worshiping God and loving Jesus. The suffering and bitterness Mary suffered has lead the Church to contemplate and meditate them. Seven have been set down as the most prominent sorrows that Mary suffered. 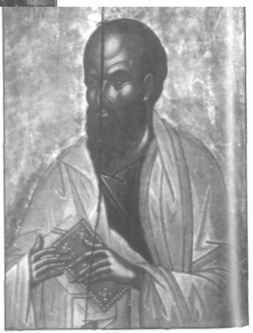 • the Prophecy of Simeon. • the Loss of the Child Jesus in the temple. • the meeting of Jesus and Mary on the Way of the Cross. • the taking down of the Body of Jesus from the Cross. The name of Mary has uncertain origins in terms of the Mother of Jesus. In Hebrew it means Bitter and in Latin in means Star of the sea. In Greek it means Sympathy. All of these meanings aptly apply to Our Lady and have been contemplated by the Church. • Mary can obtain special graces for us from the Father to transform the bitterness of suffering into the gentleness of love. • She is also a guiding light on the pilgrimage of salvation home to her Son, Jesus. • Her compassion for her children in the world is shown through her appearances throughout the world. [Mary can only appear through the Will of God. It is part of His Plan]. Due to Mary's Immaculate Conception [she was without sin] this meant she did not die in the same way as normal people, death being a consequence of original sin. She was assumed into heaven and suffered no pain and no corruption in this passing. This is called the Assumption. [read more on the Assumption]. Involved in the Second Eve theme for Arwen is the part she plays from afar. Mary didn't accompany Jesus during his public life but remained in the background praying for him and continually offering her yes in the gift of her Son to the Father and for Humanity. Arwen remains out of the picture until the end of the story, then her role becomes apparent: not only for Aragorn who will become King, but also for Frodo, the 'everyman'. In Appendix A it is pointed out by Tolkien that she 'watched over Aragorn from afar.' She then joins him at the critical climax. But it is Aragorn who departs first voluntarily, like Jesus, and Arwen, like Mary, is left distraught. "But let us not be overthrown at the final test, who of old renounced the Shadow and the Ring. In sorrow we must go, but not in despair. Behold! we are not bound for ever to the circles of the world, and beyond them is more than memory. Farewell! " [LotR p.1038]. Beyond them is more than memory! Indeed! This does not mean there is no sorrow or suffering in the story, but that there is no despair. 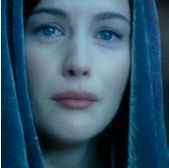 Arwen, through her love for Aragorn, trusts in the Creator for the life to come from the renouncement she has made. Her free choice through love [for Aragorn] trusts in providence to provide in the unknown. She suffers at the end, and even is tempted to despair, but she accepts the fate and lays down her life in Lorien. There is a symbolism in returning to Lothlorien, not Rivendell the home of her father Elrond, to find peace and final rest. Lothlorien was a quasi-Garden of Eden on earth, 'the heart of elvendom on earth', a place of healing and preservation, and Arwen symbolically returns there to pass away and gives up her life. [see also First and Last Things]. She is assumed into eternity.